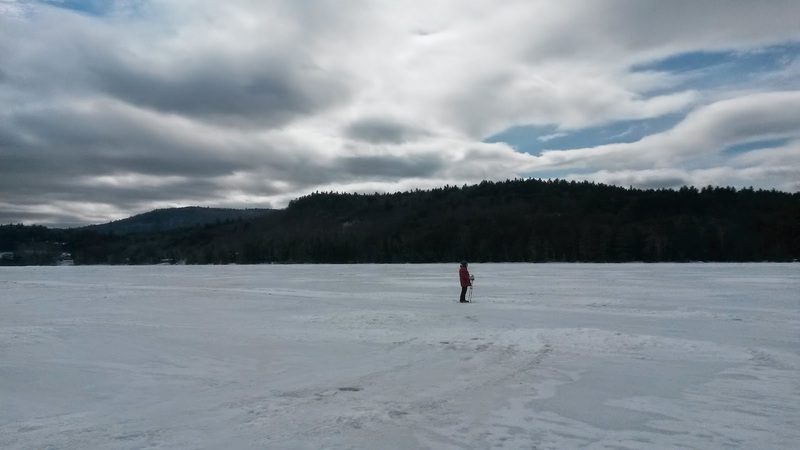 Lake Wicwas Nature Journal: March 22, 2015 - Spring??? The stars say spring has arrived, but mother nature says otherwise; winter was still very much in control when I took a walk on the lake this weekend. 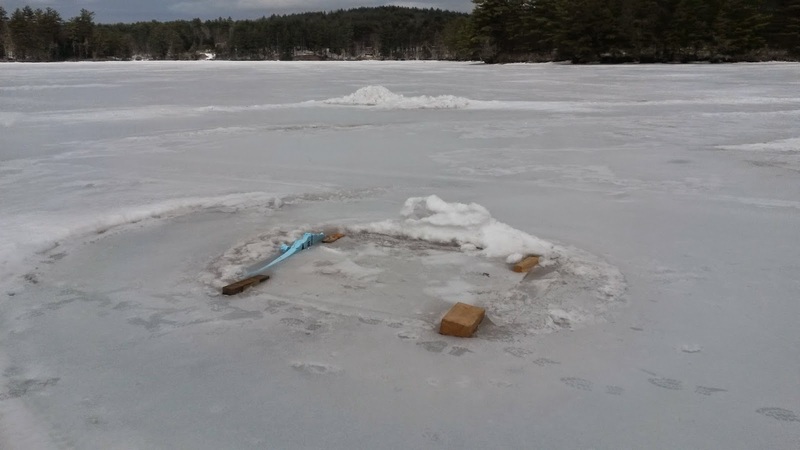 A hole cut through the ice, almost at the limit of the ice auger, shows 25 inches of ice is still protecting Lake Wicwas from the sun's warming rays. 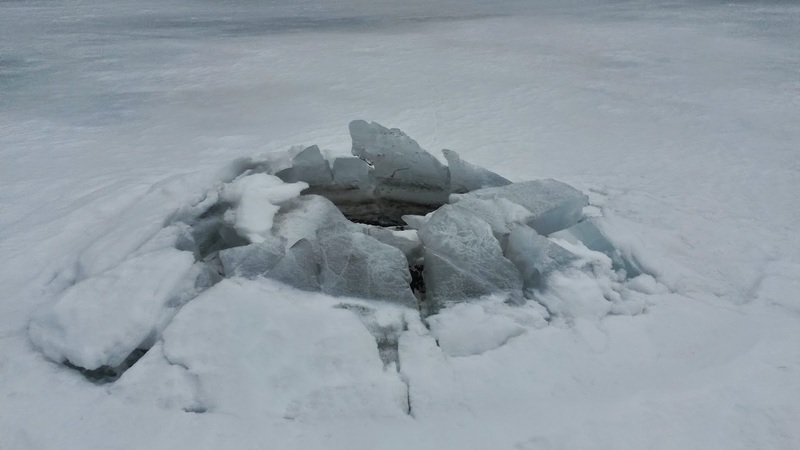 Near one of the islands in the center of the lake we discovered one of the more intriguing natural events I've seen, something that appeared to be a minature volcano in the middle of the lake, with giant ice chunks thrown up around an open center. A Volcano on Lake Wicwas? As we approached it became clear it was larger than it appeared from a distance. 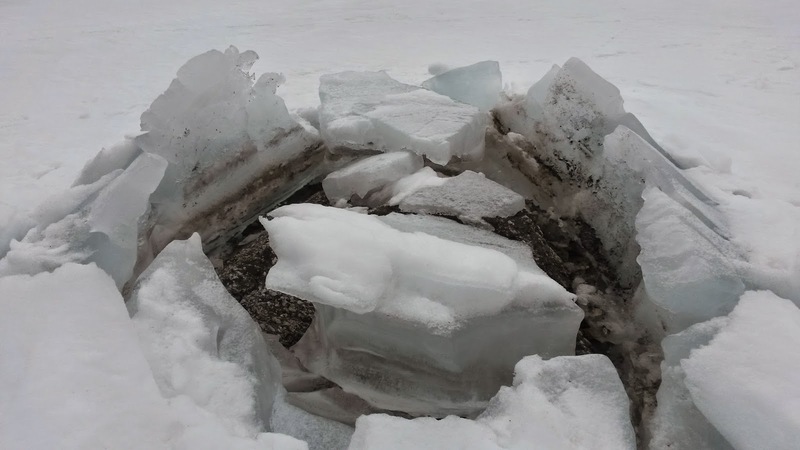 Upon peering inside, the source of the volcano became evident: A large rock (made of Kinsman Granodiorite no doubt) lying just below the surface of the lake provided the impetus for the eruption. 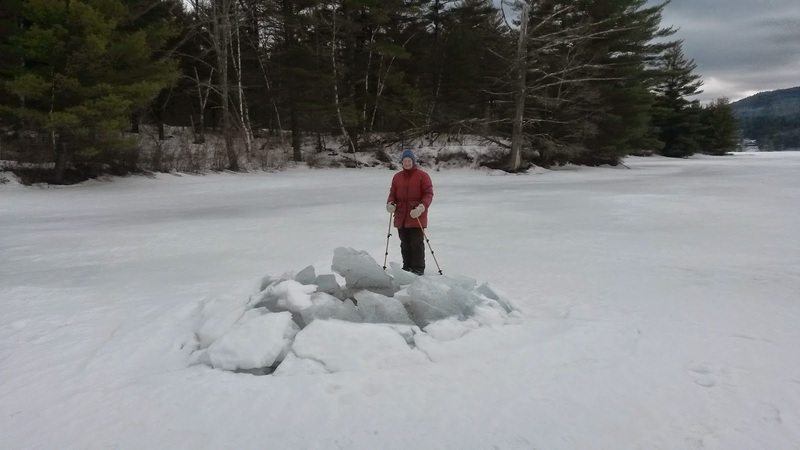 My guess is that the ice formed above the rock last fall when the water was high, and then all the snow this winter built up on top, adding to the mass of 25" of ice on the lake. 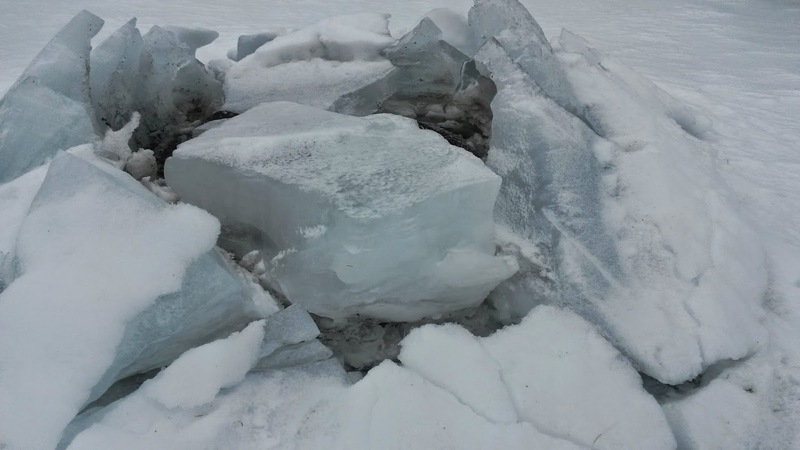 Then as the lake drained during the winter, the ice dropped down below the top of the rock, prying up the chunks of ice. I expect this artifact will survive for a while considering the cold forecast for the next week. If you're interested in seeing it first-hand, it is located off the west shore Sheep Island, about 200 yards from the southern tip of the island. Other not-so-natural items on the lake weren't so exciting. 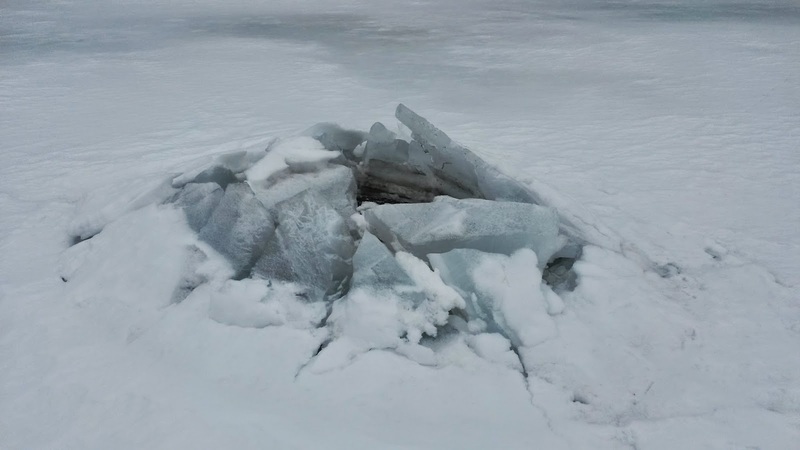 The trash pile made two months ago by fishermen (see 25 January 2015) is still there, complete with beer cans, and now there are remnants from an ice-fishing house left behind. Warning for early boaters and bass-fishermen: be on the lookout for flotsam in Lake Wicwas this spring. Even though the weather has been cold, the animals are becoming much more active. I found the track of good size moose frozen in the shallow mud from one warm day. This large animal has giant hooves, and travels 37 inches between steps - over three feet! Lots of rodents are out now as well, including the first chipmunk of spring, all nicely sharing the spillage from the bird feeders. Note that the department of fish and game has announced the bears are active as well, so it's time to take down those feeders. One afternoon I spotted a small hawk - probably a sharp-shinned hawk - sitting on a branch on the shore line. It swooped down to a bit of open water and sat on the ground. At this point we noticed a gray squirrel on a tree right next to the hawk - very strange, as usually not a squirrel nor a bird is to be seen when a raptor makes an appearance. Even more strange, this squirrel starting climbing down the tree right toward the bird. Just as we thought this rodent had a death wish, the hawk flew off in the opposite direction, and that's when we saw the root of the circumstance: it had a small gray object in its talons. It appears that mother squirrel had just lost one of its young. Mother ran after the bird a few yards, but then stopped and looked off into the distance at the disappearing hawk. She then sat motionless on the cold, frozen snow for a long time, wringing her hands, hoping, though knowing, she had seen the last of her offspring. But what a bold move to stare down a hawk to try save one of her own! It was yet another reminder that the natural world is a constant battle for survival. But she will have another litter very soon, especially with all the easy food she gets from a winter of bird feeders! It gives me a lot more compassion when the squirrels get to the feeders. And it's nice to know we are supporting the entire food chain. So the animals are out and ready for spring; how about you? 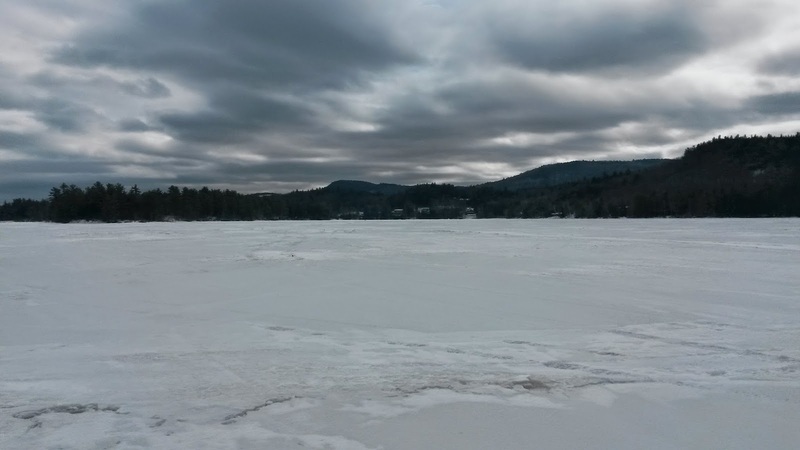 Can you believe we'll be swimming in this "water" in a mere two months time?